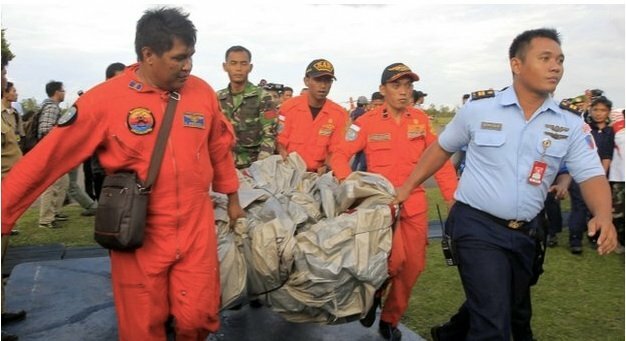 A recovery mission is now underway for the victims of the AirAsia plane crash. 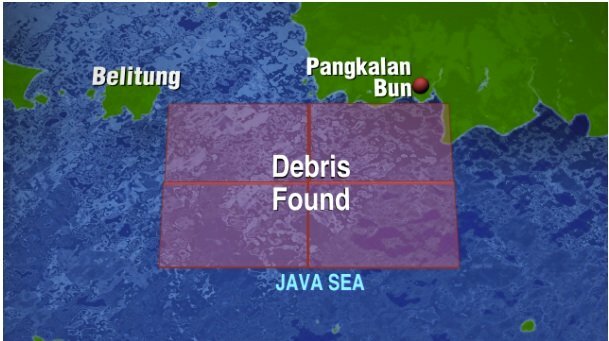 Three bodies have now been recovered after debris from the missing AirAsia jet QZ8501 was found in the Karimata Strait 110 nautical miles southwest from Pangkalan Bun last yesterday. Up to 40 bodies are thought to be in the area around the crash site of AirAsia flight QZ8501. Yesterday debris was seen floating in the ocean was from the wreckage of the plane, and a large shadow on the seabed which is thought to be the rest of the aircraft. 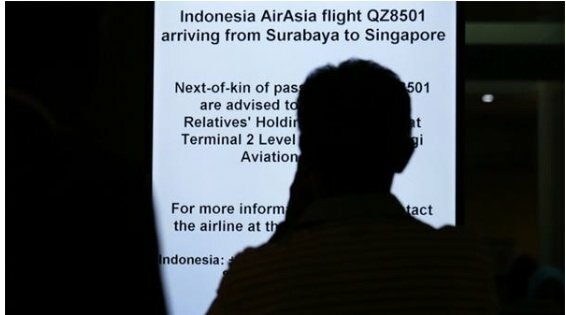 A statement from the airline read ”AirAsia Indonesia regrets to inform that The National Search and Rescue Agency Republic of Indonesia (BASARNAS) today confirmed that the debris found earlier today is indeed from QZ8501, the flight that had lost contact with air traffic control on the morning of 28th. “It is the worst feeling, one could have, but we stay strong for the families out there, so that we can look after them,” said AirAsia Group CEO Tony Fernandes, at a news conference in Surabaya. As the search and rescue mission began grieving relatives had to be treated by teams of medics when confronted with images of bodies floating in the sea shown on local television. The news came after an Agence France-Presse (AFP) journalist took images of the debris from a search and rescue aircraft over the Java Sea. “The position is 10 kilometres (six miles) from the location the plane was last captured by radar,” he said. CNN are reporting that a plane has spotted smoke coming from an island in the search area of the missing AirAsia plane. The head of Indonesia’s rescue operation is saying that the smoke trail is coming from Long Island, just one of thousands of islands in the area, and that two more search jets will be sent to investigate. Of course, this is just one of many leads to surface as the the families of the missing face an agonising wait for confirmation. 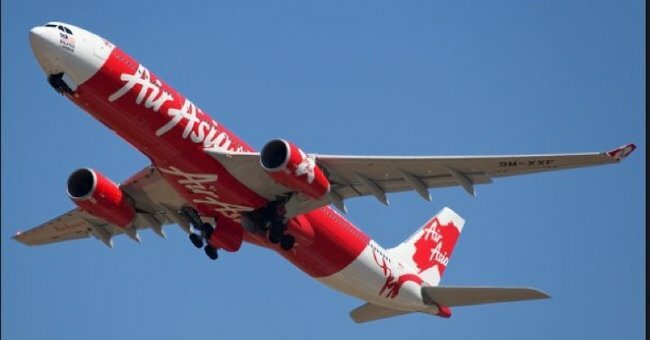 The search for an AirAsia flight that went missing while flying from Surabaya in Indonesia to Singapore on Sunday with 162 people – including 18 children – on board has still uncovered no evidence of where the plane went down. The flight lost contact three minutes after a request to deviate from flight plan. CNN reports that the request was denied with air traffic control approving the pilot’s request to turn left but denying permission for the plane to climb to 38,000 feet from 32,000 feet. Puzzlingly there was no distress call from the flight. Indonesian officials have said they remain hopeful of locating the Airbus 320-200 quickly, but said it was too early to detect any of the electronic “pings” from the jet’s black box recorder. The search today is expected to be widened to cover West Kalimantan, on the island of Borneo, and the southern parts of the waters off the coast of Belitung island. Late in the search yesterday an oil slick was spotted in the Java Sea by an Australian plane. Experts will travel to that area today to test the oil and see if it is aviation fluid. More than 100 distraught relatives of passengers aboard missing flight QZ8501 once again spent the night hunkered down at a makeshift crisis centre at Surabaya airport in East Java, waiting anxiously for news. Fairfax Media reports that tearful family members wait, wearing a sign hanging around their neck saying “Keluarga” (family). It is the third aviation disaster for a Malaysian airline this year after the tragic loss of MH17 and the disappearance of MH370. 155 passengers and seven crew were on board QZ8501 when it lost contact with air traffic control just after taking off from Indonesia on Sunday morning, 18 of these are children. Nationalities of crew: 1 France, 6 Indonesia. The Herald Sun is reporting that one of the Indonesian nationals, Kevin Alexander Soetjipto, is living and studying in Melbourne. Kevin was due to finish his studies at Monash University next year, and had been on a holiday home that had taken in New Zealand. At the time of the incident he was heading to Singapore, possibly with his parents. A Monash spokeswoman, Stacey Mair said last night, “We are deeply saddened to learn this news in relation to one of our valued student community. 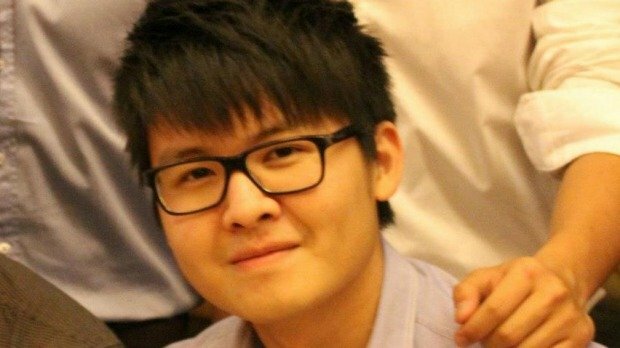 Young Melbourne student Kevin Soetjipto is among the missing. The British national on board QZ8501 is Indonesia-based energy executive Choi Chi Man. His two-year-old daughter Zoe was with him on the plane. 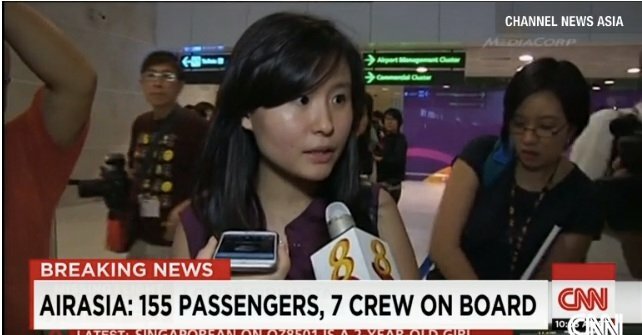 One relative at Changi Airport, Louise Sidharta told CNN that her fiancée and his family were on the flight. “It was supposed to be his last vacation with his family” before the wedding, she said. South Korean media are reporting that one of the Koreans on board is 37-year old Park Sung-beom, a missionary from a church in Yeosu. YTN says he was carrying out mission work at Malangwi near Surabaya. His wife, Lee Kyung-hwa, 36, and their 12-month daughter Park Yuna are believed to be with him on the plane. 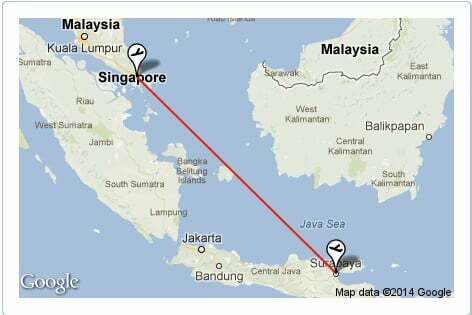 QZ8501 had been due to land in Singapore around 11.30am AEDT after departing Surabaya, Indonesia. The flight lost contact three minutes after a request to deviate from flight plan. Reports indicate there was no distress call from the flight, but that the pilot had requested a “left track” to avoid clouds and asked permission to climb to a higher altitude. 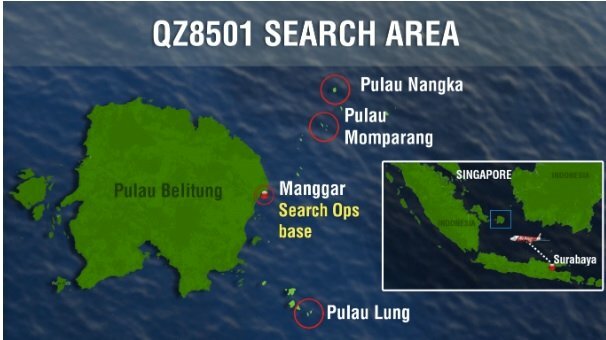 The search for QZ8501 is now concentrating on an oil patch spotted off Belitung island, Indonesian Air Force spokesman Hadi Tjahjanto told AFP. Officials are trying to ascertain if it is aviation fuel, or from a vessel that had travelled along a shipping line. “That’s the preliminary suspicion and it can develop based on the evaluation of the result of our search,” he said. He said that Indonesia is reaching out to countries with the necessary ‘tools’ to retrieve the plane from the seabed, such as submersible vehicles. These include the UK, France and the US, who have offered their assistance to the Indonesian government. Earlier in the day it was reported that An Australian plane had spotted objects in the sea while hunting for the missing AirAsia passenger plane flight QZ8501, according to officials. The Associated Press is reported that an Australian plane spotted the objects within the search area however these we’re later found to not be a part of the plane. 30 ships and 15 aircrafts are searching for the plane. The Transport ministry has also asked the army to carry out ground searches, including in mountainous areas. “We have focused all our strength, from the search and rescue agency, the military, police and help from the community as well as the fishermen,” said rescue agency chief F H B Soelistyo. As speculation mounts over what happened to the missing plane Channel News Asia reports that terrorism has been ruled out so far as no one has come forward to claim any such act. Instead it is increasingly likely that bad weather has been the cause. The Telegraph reports that Oliver McGee a professor at Howard University in Washington DC said the “ highly turbulent black storm cells” which feature heavy winds and lightning with large hail stones” are known to be injected in the engine of an airline and cause foreign object damage and high cycle fatigue failure of engine parts. Or was it a deliberate act? SkyNewsUK reports that usually pilots maintain communication with air traffic control until the very last minute, David Learmount, the operations and safety editor of Flight Global told the network that as the pilot’s mantra is to aviate, navigate and then communicate there are concerns that something distracted them meaning they were unable to speak to air traffic control. A statement from the Prime Minister’s office said last night that PM Tony Abbott has spoken to Indonesian President, Joko Widodo, and offered to do “whatever we humanly could to assist” in the search for flight QZ8501. The Prime Minister assured the Indonesian President that an Australian P3 Orion aircraft is ready to provide any assistance that might be required. Chief Executive Tony Fernandes speaks at a press conference last night. AirAsia is a Malaysia-based airline that is popular in the region as a budget carrier. It has about 100 destinations, with affiliate companies in several Asian countries. The Chief Executive of AirAsia is a Malaysian entrepreneur Tony Fernandes, who took over in 2001. The BBC reports that Mr Fernandes is almost always in jeans and an Air Asia cap when interviewed. They report he is known as Malaysia’s answer to Richard Branson. 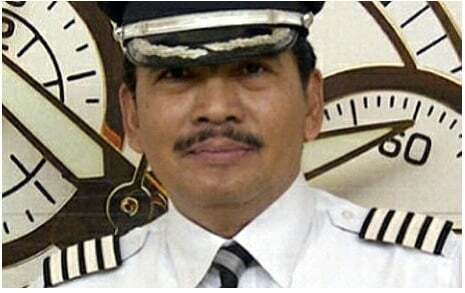 The pilot Captain Irianto clocked 20,537 flying hours of which, 6,100 flying hours were with AirAsia Indonesia on the Airbus A320 according to a statement put out last night by AirAsia. 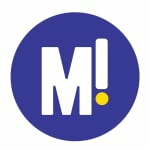 His nephew, named as Doni told Indonesian news website Detik.com that Iriyanto cared very much about people who needed help. An image of him was posted on social media by his daughter Angela Ranastianis. 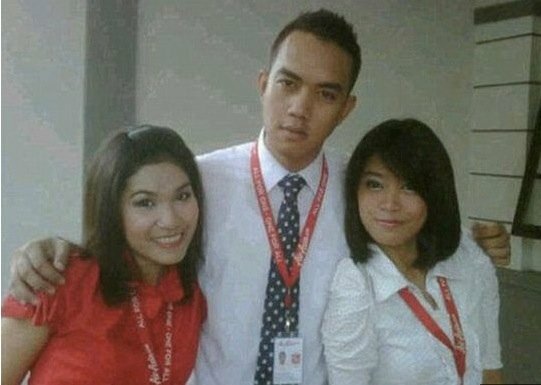 The first officer, Remi Emmanuel Plesel has a total of 2,275 flying hours, AirAsia said – he is a French citizen who is onboard the plane. 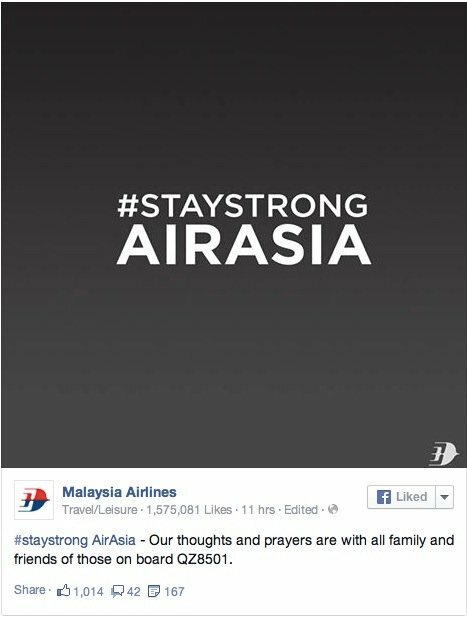 There are reports today that one of the flight attendants on QZ8501 tweeted messages of support to the victims of both Malaysia Airlines disasters. Oscar Desano, from Indonesia turned to twitter to express his grief over the disappearance of MH370 and the downing of MH17. And now it is twitter’s turn to show support for him.